So I know ya’ll are dyin’ to hear what the ladies were up to during Viva Las Vegas 12. If you had the privilege of being present, you already know that Viva Las Vegas was swarming with some of the purdiest ladies you ever did see. While you fellas might’ve been out merely lookin’ for ladies – I was lookin’ for fellow Grease Girls. 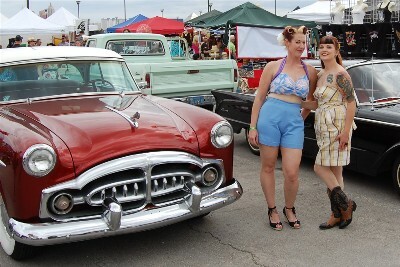 Being that the car show at VLV draws one of the biggest grouping of home-built cool traditionals, customs, and rat-rods – I was hoping I’d find a few of those “builders” who also happened to be ladies. As Stude (my own 1955 Studebaker Champion) and I arrived on the lot Thursday evening, many other cars had already arrived, but we were the only girl-owned car so far. 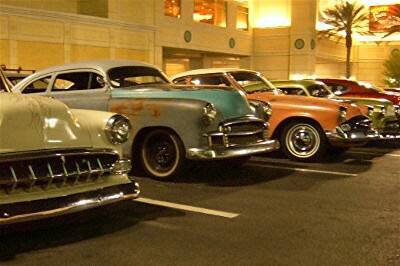 By the time Saturday rolled around the entire lot reserved for the VLV 12 Shifters Car Show was full, with ample stragglers in The Orleans parking lot. As soon as I showed up on the scene Saturday morning, I wholeheartedly began my search for fellow car ladies. You’d think finding other lady car owners wouldn’t be too much work – but with so many people, things to do, and pin-up models mulling around – finding anybody is a challenge! The first couple of ladies I encountered were local Las Vegans. One had a Metropolitan Nash – who even though she’d owned it for 17 years had never needed to do any work on it – she did tell me she’d managed to stuff all of her young grandchildren (11 I think) in there at once! Another was a 61 Mercury Meteor Mama, while she was a pro at pin-up girl hair as she coiffed her daughters goldy-locks, it sounded like she hadn’t gotten too greasy under the hood of her ride. The day was beginning to pass by and I still hadn’t found another woman who did any work on her car. 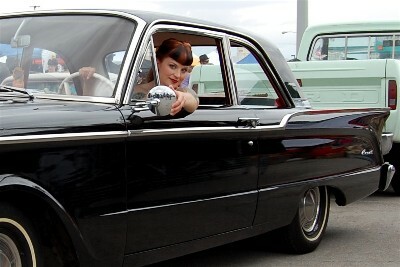 I did hear elusive rumors of the presence of a couple girls car clubs – The Vixens and The Fender Skirts – but never managed to nail down any of them OR whether they had cars present! Just when I was losing all hope, I ran into not just another lady – but another Studebaker owner! 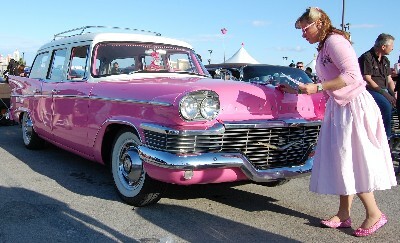 Pinkie drives a 1958 “Pink” Studebaker Wagon. She spent 2 years restoring this baby which rolls with the original Studebaker V-8 engine. Just like me, she didn’t know much about cars when she got into this and has kind of learned along the way. But she learned enough to do the needed body and engine work – with some help from friends. She’s had the Stude for 12 years now and enjoys going to various car shows, sometimes with her fellow members of the Sequoia Chapter of the Studebaker Drivers Club, where she loves to see people’s reactions and delight in response to her bright pink baby! As if the Packard wasn’t enough, Becky Sue’s car for this year is a 1963 Comet. This one didn’t require too much work from them – as it’s in super-terrific original condition as-is. What I love about Becky Sue and her car’s is that they’re fun, driven often, done with style, originality, and her own hard-earned sweat. I was glad to meet the ladies I did – and hope that next year more will come out of the woodwork – I mean, er, engine grease. Who knows…since Becky Sue and I are both in So Cal there’s already been mention of a car club forming. Whose name is exactly what I pondered as I made the drive back across the desert to home sweet home. This year’s Viva stood up to it’s reputations. Cool Cars. Purdy Women. Plenty of Pabst and Lots of Music. Stude and I will be back next year – and ladies, I’m planning on there being more Grease Girls represented – so start gettin’ your hands dirty now! If I missed any fellow Grease Girls at Viva – leave me a comment and let me know about your ride. All you ladies out there who call So Cal home, drop me a line, I’d love to set up a gathering! Viva la Grease Girl! For more fun Viva photos check out my photos page for Viva Las Vegas-the cars or Viva Las Vegas-the other fun…or check out tons more from other folks over at MyRideIsMe.com! Inspiring the world, one grease monkey at a time, to get in the garage and get greasy! Grease Girl is a place to learn, share and delve into the hot rodding lifestyle. Whether it’s a specific garage DIY you’re looking for or just want to dive into the journey of a fellow car loving gal, you’ve found the right place. Enjoy learning and laughing along with the adventures you find here on Grease Girl…and then go out and create your own!